To a solitary child, the world outside his head can feel a bit oppressive. Each morning of the school week becomes an exercise in steely determination. He knows he has to cross that border at the edge of his internal life and enter into the world outside. So with every step toward the school yard, he tenses another psychic muscle (and probably a few physical ones). Like the proverbial fish out of water, he struggles to survive in that strange, hostile environment. And if he’s a kid like me, he sneaks back as often as possible into the safety of his fantasies for a quick gulp of fresh air. I felt very much on my own as a kid. But I figured a lot of people had to feel the same way. Why else would catechism classes and Sunday masses make such a point about this god who knew us intimately and understood what was in our hearts? If there weren’t an audience eager to hear it, why tell us He gave more credit for good intentions than for how often you were able to hit a damn softball at recess? I believed that story. And it gave me a lot of comfort late at night while I lay in the dark, feeling very much alone. No matter how lousy things seemed then — at age seven or eight — I felt confident there was someone who understood me, watched over me, and gave me points for what went on inside my head. The church promised that my suffering now would earn me a reward from heaven later. Unfortunately, the reward it promised was a seat for all eternity at the right hand of Jesus. Now I’ll admit there was some satisfaction in knowing that those people who made my days miserable — the bullies, the gym teachers, the school crossing guards — would be spending that same eternity in the sulfurous pits of hell. But all that seemed an awfully long way off. I’d really been hoping for some payoff a little sooner and right here on earth … ideally one with a more positive spin than simple revenge. I was an earnest child, however disturbed. And being earnest, I worked hard to see beyond the bland picture the church painted of its god’s Celestial Order. I sensed something of real substance in the messages the church offered — a benevolent god, the value of good intentions, peace on earth, goodwill toward men — something that felt right to me. Moreover, the truth of those messages came back to me 100 times over and through as many channels in the greater [and by “greater,” I mean both “way better” and “secular”] culture around me. All those messages collected in my head and, over time, they formed bright crystals, as hard and brilliant as pieces of rock candy. And in those crystals I saw a vision of a heaven on earth. What if goodwill were able to trump brute strength? What if the reward for treating people with kindness were greater than the value of the milk money I had to guard from the bigger kids on the playground? And what if the true order of the universe included people empowered to reward good behavior and protect the weak from injustice? That picture fit well enough with what they fed me in Saturday-morning catechism class. Certainly if we could pray to the Blessed Virgin or any number of saints to intercede on our behalf, then there might be other champions right here on earth. The evidence to support my theory was all around me. I used to spend hours pouring over my brother’s old comic books in the basement. Every one of them was filled with stories of supernatural beings who hid their powers from the casual observer. But I knew their secrets. And I could see plainly that God put them on earth to avenge the weak and to fight for justice. Why else would he have given them those powers … and such enormous pecs, such pronounced abs, and the skintight outfits that showed them off so well? The crush I had for Superman grew as much from my appreciation for what he did as from the way he looked. And it never escaped my notice that he had to hide his most special qualities — his secret life — from the people around him, even as he shared them with me, his devoted reader. The TV shows that filled my afternoons and evenings brought me stories of beautiful witches and genies, talking horses and automobiles. Like my superheroes, they hid what made them special in plain view of the dullards who filled their towns and cities. And like those superheroes, their purpose was to do right for the people they loved. I wanted desperately to believe in such a world hidden just out of plain sight; a world of others, outsiders; a world in which super-powered good intentions created a kind of magic among the people around me. In a world like that, people would behave better; not because they had to, but because they’d understand the value in practicing a little kindness, in exercising simple civility. But it’s impossible to believe in something for very long without getting some small proof that it might exist out there, beyond the gray edges of the dull and the day-to-day. And I got that proof. Every year, beginning with the day after Halloween, my eyes would light up with renewed hope in the promise of a better world. Walking into the store that day was like waking from a bad dream. The world had been scrubbed clean of its grim, day-to-day reality in a wave of carols, lights, tinsel and that fiberglass angel hair that’s probably still eating away at the lining of my lungs some 40 years later. Christmastime was here. And the magic of a brighter, other world wasn’t just inside my head. For the next two months, everyone around me seemed compelled to pay homage — or at least a respectable amount of lip service — to a reality I knew was only just out of sight during the previous 10. Even the pieces of the story I got from church were magical: a star in the east; a god born in a stable; shepherds and animals, angels and kings all coming to pay their respects to the promise of the season. Typically, the church seemed to miss much of what was so wonderful about Christmas and embalmed even those magical elements in a rigid story that gave all the emphasis to the wrong characters. According to Catholicism, Baby Jesus sits at the center of the Christmas universe. And just like the plaster figurines we placed inside the stable my father built out of an old whiskey carton, His doting parents sit to either side of him. [NB: Mary gets considerably more emphasis here, since God chose her to bear His son. Joseph’s part is mostly one of patience and acceptance: good character traits in a supporting role, but hardly the stuff to inspire a cult of religious devotion.] There are shepherds who leave their flocks in order to visit the child; an ox and a lamb who watch over Him. Most wonderful of all is the choir of angels who sing carols and (I imagined) sound just like Mitch Miller and the Gang. It’s not that there’s any one thing so terribly wrong with this picture of the world at Christmastime. It’s the general lack of holiday spirit that bugs me. Compared with the truth I knew in my heart, the approved Catholic picture of the Celestial Hierarchy of the Christmas Season feels a bit stark. As I would see time and time again over the years, the church had clearly missed the point. Any god who would create that star and all the drama leading up to the birth in a stable — the very splendor they preached from the pulpit — wouldn’t stop there. If God were truly in charge of the whole show, then nothing was outside of His plan. He wasn’t responsible only for the Baby Jesus and that star; it was clearly His idea to create tinsel and holiday record albums and those amazing little twinkle lights that didn’t even melt the branches on our plastic tree. He must even have had in mind styrofoam snow and those plastic flocked Santas, like the one that turned in an endless pirouette at the top of the biggest tree at King’s, its gears grinding so loudly you could hear it way over in the shoe department. And what about the TV programs? Wasn’t it part of His plan to create the specials that played once a year throughout the month of December? And wasn’t He ultimately responsible for those wonderful episodes of the regular series that taught us about the true spirit of the season? Of course He was. This was His way of letting us know there truly were special people on earth whose only purpose was to make life a little kinder to the rest of us. I was most confident of all in His plan to populate the world with those magical creatures who saved the rest of us from complete despair. If God could create Baby Jesus with the power to charm farm animals, turn water into wine and raise the dead, then He could certainly create Santa and Rudolph, Superman and Wonder Woman, the ghosts of Christmases Past, Present and Future … and yes, even Samantha Stephens. For two glorious months, the world of my fantasies spilled out into the everyday. It bathed reality’s cold, hard truth in the soft shimmer of tinsel, in the glow of the twinkle lights and electric candles that lit up the long, dark nights of early winter. Most importantly of all, everyone took part in this fantasy of mine — the stores, the television programmers, the public library, my teachers and yes, the Catholic church, too. Hell, even that nasty school crossing guard had one of those Santa pins on the lapel of her uniform; the kind whose nose lit up when you pulled on the cord hanging below. Lonely children and Christmas go together so well for a reason: their need for the beauty of the season keeps its true spirit alive. It’s not really about expensive gifts or even the obligatory holiday parties. It’s about finding a moment in the year when people think just a little bit harder about doing something for those around them, about finding in themselves the will to be kind. It’s no wonder that one of my favorite Christmas movies is Val Lewton’s Curse of the Cat People (1944, dir. Gunther von Fritsch & Robert Wise). This is the story of an odd and solitary little girl named Amy (Ann Carter) who finds her only friend in a person that no one else seems able to see. The movie pretends to be a sequel to Lewton’s Cat People (1942). That movie’s heroine, Irena (Simone Simon) died in its final scene. Whether or not she actually changed into a panther when aroused was never entirely clear. But now her widower has remarried, moved to Connecticut and had a daughter: Amy. Dad’s none too thrilled to learn that Amy claims her special friend to be the wife he’d lost some years earlier. And we’re never quite clear if Irena really has returned from the grave or if Amy has simply lost all touch with reality. But it doesn’t matter. The tenderness of this moment on Christmas Eve — of gifts exchanged with love between a fairy princess and a lonely little girl — explains the promise and the glory of the Christmas season. It’s pure magic, just as Christmas should be. All this obsession with the season may sound like a set-up for horrible disappointment when it’s over and the people on the street revert to their previous day-to-day manners. Sure I’m sad when the season is over and we move from the magic of candles and twinkle lights to the bleak cold of winter days. But my sadness isn’t profound. To paraphrase Mr. Nietzsche: a person can’t look into the abyss without changing forever his knowledge that behind the world’s veneer of bright rationality lies chaos. In much the same way, I can’t look into Christmas — its lights, its beauty, its promise of a kinder world of good intentions — without knowing that people can be better when they just put their minds to it. If will or tradition, peer pressure or the cheap glitz of tinsel and commercialism can coerce people to behave more like human beings for a couple of months out of the year, then life just doesn’t seem so grim over the other 10. Like little Amy — crazy as she may be — I look for my own redemption in those gifts exchanged among friends with love. 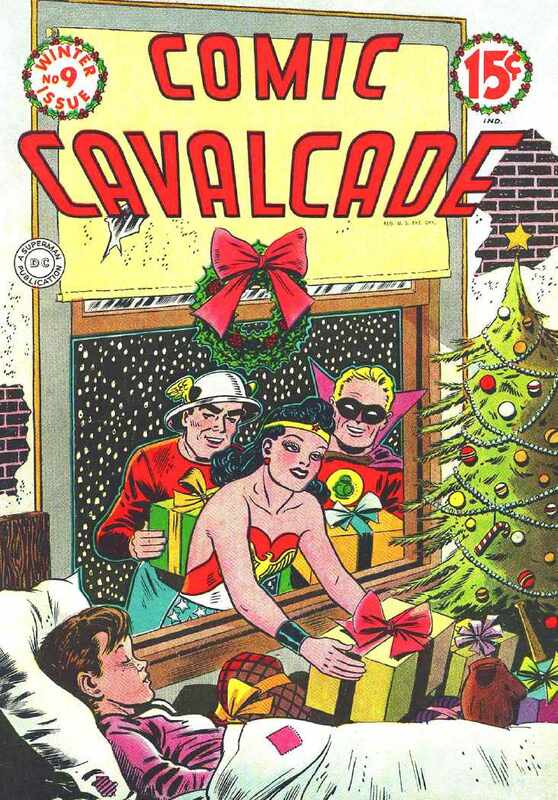 * The covers of Comic Cavalcade No. 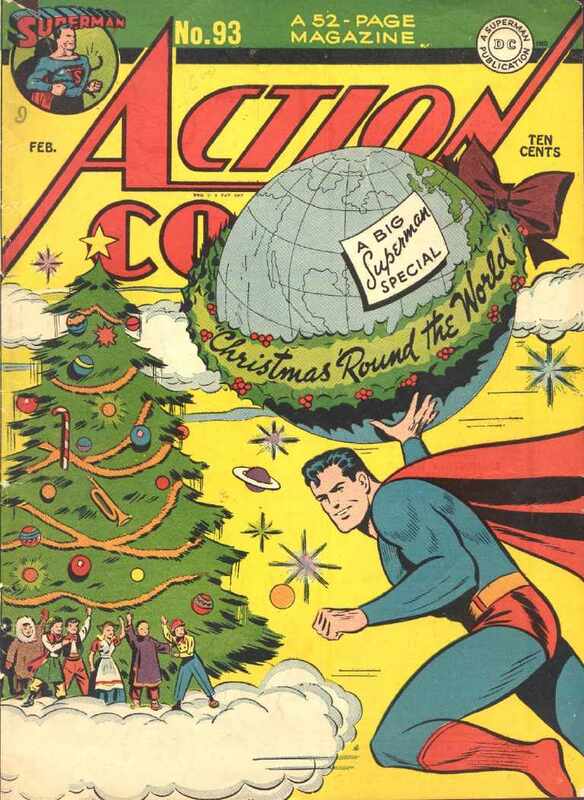 9 (Winter, 1945) and Action Comics No. 92 (February, 1946) come courtesy of Golden Age Comics.